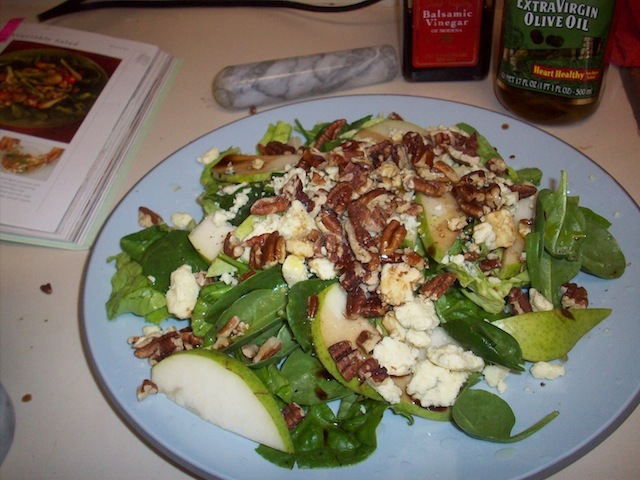 Better Days Are Here Again: Pecan, Pear & Blue Cheese Salad – Eat Me. Drink Me. The end of Spring Break and the beginning of actual Spring in Davidson are coinciding nicely. Although I ate nothing if not well at the lake, by the end of the week, I found myself craving fruit and sunshine – which could have been the effect of a self-imposed exile to relatively little movement, starch-heavy foods, and the indoors. Since bringing those groceries back to my apartment, I’ve been snacking on fruits and making myself delightfully crisp, vegetable-rich meals (avocado, cherry tomato, blue cheese on baguette – go). But my favorite concoction so far has been this pecan, pear, and blue cheese salad. 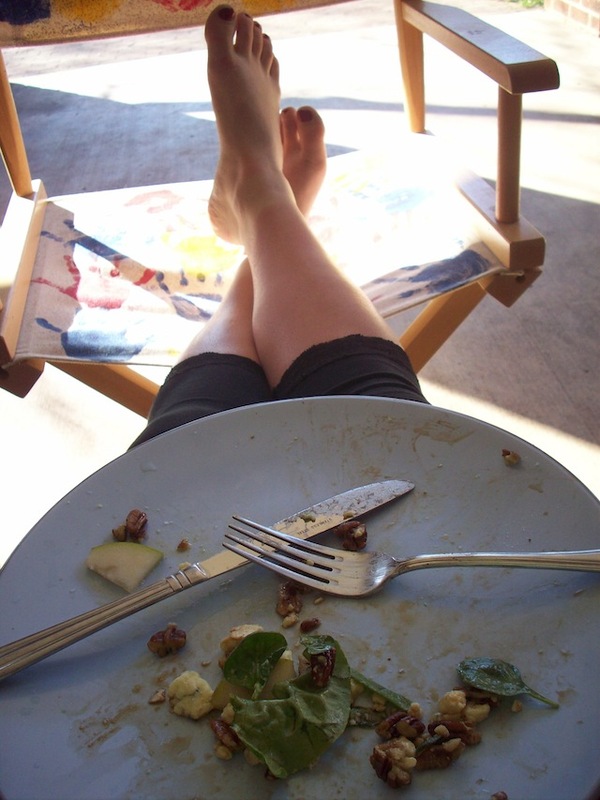 I ate the whole thing slowly, carefully putting together perfect bites of sharp, creamy cheese, sweet pear, and mellow pecan with the perfect amount of spinach and Boston lettuce to curb the richness. Eating this salad, sitting on my front porch, watching people walk by – nothing could be more perfect. Unless, of course, I could enact this scene again without the sunburn. Lightly toast pecans in a skillet or in the oven, then cut or crush them into smaller pieces. Toss all salad ingredients, including toasted pecans, together. In a separate bowl, whisk together olive oil and balsamic. A good rule of thumb is to use 1/2 the amount of balsamic as vinegar. Season to taste with salt and pepper and toss dressing with salad.